Buy the Toy Story DVD box set at the Disney Pixar Specialist, DVDLand. 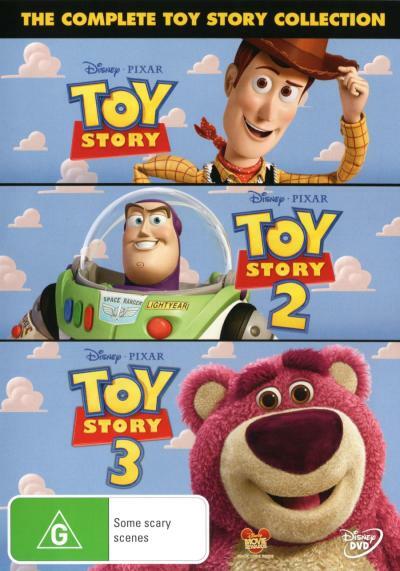 This great Toy Story DVD triple pack available for a limited time only at DVDLand. 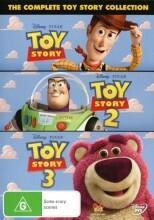 Such a great trilogy from Disney Pixar. In the first full-length computer-animated movie, a little boy's toys are thrown into chaos when a new Space Ranger arrives to vie for supremacy with the boy's old favorite (a wooden cowboy). When the feuding toys become lost, they are forced to set aside their differences to get home. This extremely popular and successful film features the voice talents of Tom Hanks, Tim Allen, Don Rickles, Wallace Shawn, Laurie Metcalf, and others. A Masterpiece of great story telling, laugh out loud humour, wonderful music and state of the art animation - Toy Story 2 is great fun for both kids and adults! Toy Story 2 features the original voice cast, headed by Tom Hanks and Tim Allen as Buzz Lightyear. Joining them is a round-up of unforgettable new characters, including Jessie the cow girl, Bullseye the horse and Stinky Pete the prospector! Click the button below to add the TOY STORY / TOY STORY 2 / TOY STORY 3 to your wish list.